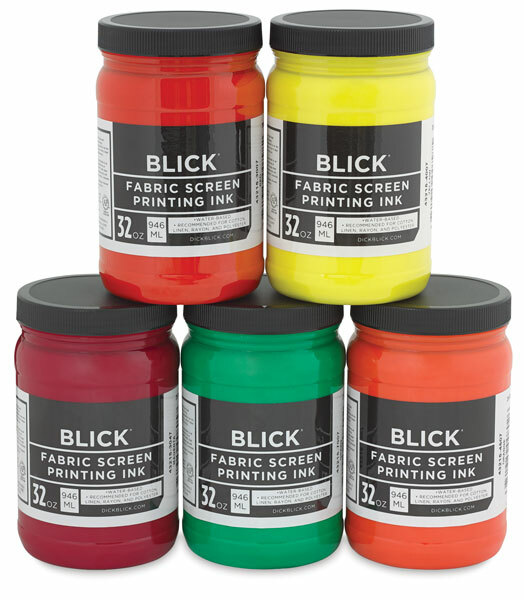 Blick's inks are made for printing on light-colored T-shirts, and other cotton or cotton blend fabrics, linen, rayon, polyester, and most other synthetics, except nylon. They are non-toxic, non-flammable, safe for school use. These inks may also be applied with a brush to tennis shoes, tote bags, sweats, etc. and they work well on paper products, too. 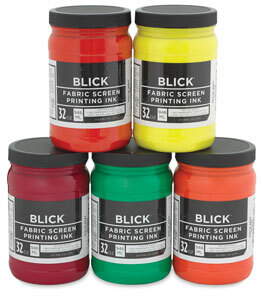 We recommend this ink for screened artwork or printmaking. For best results, we strongly recommend pre-washing garments and pre-testing the color before starting a production run. Recommended screen fabric is 74-124 mesh monofilament or 6XX to 10XX multifilament. After printing, allow to dry, then heat set with a household iron at medium heat for 3 minutes on each side or at 300°F in an oven for 3 minutes. After heat setting, garments are machine washable. Clean screens and squeegees with soap and water. We recommend using Speedball Diazo Photo Screen Printing Emulsions as a stencil for this ink (for short runs) or solvent-adhering (water-resistant) hand-cut films.